With ten years of experience working in kitchens and restaurants, I feel I’m able to safely say I’ve seen some of the worst managers any industry has to offer. Everything from the Disgruntled Downer to the Overarching Dictator, the Hopelessly Clueless and the Much-Too-Friendly have tried to run kitchens, and all failed miserably. They’ve shouted, cried, thrown things, not shown up, stressed, fallen apart under pressure, blamed and abused, talked down to staff (while shouting! ), embarrassed themselves or others, and overall found it difficult to get anyone to listen to them. Working for these kitchen and restaurant managers was often difficult and disheartening, but their inabilities forced me to reflect on what I actually wanted from my leaders, and I learned through them how I could be a better manager when it was my turn to take the wheel. And learn I did. Through much of my own trial and error, I discovered step ups and pitfalls in managing that can easily surprise you, and have long-lasting or even permanent impacts on your effectiveness as a leader. I’m positive I’ve worn the hats of many bad manager personalities over the years, and I’ve suffered from it (and not just from bad hat-head). I’ve lost valuable opportunities to build trust and respect with my teams, and I’ve learned that one of the most efficacious steps up any manager can take is to take their Employee Performance Reviews seriously. As managers, it's our duty to ensure that our directives towards our staff are clear and authoritative, and our expectations are always consistent and thorough. Nothing breaks a team apart faster than confusing commands or inconsistent expectations. Likewise, not much can match the effectiveness of correcting a weak point in your workplace than a performance review. Sitting one-on-one with your staff allows for open communication, constructive criticism and honesty, and that can be the solid glue that keeps your team together. But, handled poorly (or not at all), employee reviews will quickly destroy your trust and authority. So how do you handle these less-than-forgiving situations? Using some of the key qualities that make you a good manager will make all the difference, even when the employee is on the receiving end of a review that's more constructive criticism than they may be expecting. If you don't do reviews often, staff won't expect them, and attempts to suddenly put in the effort will seem disingenuous, forced, and harsh. And can you blame them? If the only time your staff have ever been subjected to an employee review is when a Head Office representative is coming for a visit, the message you're sending is that it’s only being done because it’s required and that you threw it together on the fly. Now your staff will see any negative criticism as a direct attack on their work ethic, their personality, and their team spirit, not to mention a personal jab at their ability to do the job. If you give the impression you spent less than half an hour coming up with a list of criticisms while you prune your feathers to the HO reps, you risk losing the trust of your staff, both personally and professionally. Hurt feelings and resentment damage the company culture by breaking apart otherwise solid teams. Instead of letting employee reviews fall to the wayside, mark two dates on a calendar. The first date is the day you will notify staff of upcoming reviews, and begin preparing them. The second date should be no more than two weeks later, and will mark the commencement of the review period. Lastly, do yourself a favor and don’t waste this planning by putting everything together at the last minute. Make time to create honest and productive talking points, and make sure everything you plan to say is relevant to your ultimate goal: helping your employee be the best they can be. The point of an employee review is to praise and encourage good behavior, as well as point out and begin correcting bad behavior. Wasting your review time talking about anything and everything will send employees all the wrong messages. Incessant rambling is a bad behavior in itself, and trying to strengthen your authority as a manager while letting your mouth get away from you does the very opposite. Ensure you get the most effective results from your review time. Take a minute to examine your review beforehand, look for a handful of the key points you need to get across, and make them handy to refer to during the review. Does she need to work on her initiative and teamwork, but does excellent work independently? Is his insubordinate attitude less than acceptable, and he's beginning to walk a fine line? All reviews should be written out and filed, so use your available paper-space to keep you focused. Write down a few sentences on what you need to say, and stick to it. 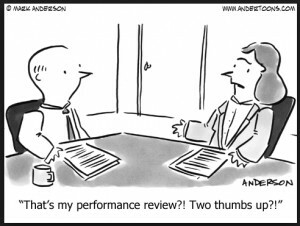 If you’re avoiding a performance review because you’re afraid of potential confrontation from telling an employee that a behavioral change is needed, now is the time to buckle down and get it done! Your team will worsen with each passing incident, so grab that bull by the horns and use this one-on-one time to address the overarching issue and give them a chance to turn it around. The key to avoiding employee confrontation when dishing out bad news is to stay on their side. Don’t turn the situation into a You vs. Me scenario; this will cause resentment and get you nowhere. Instead, draw attention to an employee’s behavior that you’re able to work with them to resolve. Work on finding a situation where their behavior can either be stopped, or won’t have a chance to show itself. During their review, address the issue for which you have a workable solution. Maybe try taking them out of their current role, or assigning a new task that pulls them away from their normal interactions. You can give him something physical to do, or allocate her more responsibility (bearing in mind their personality, though often cranky employees are just bored employees). What’s important to remember is this: negative criticism turns into constructive criticism when a workable solution is provided, and you strengthen your authority as a manager by working with your employees rather than subjecting them to criticism and walking away. I get it; they’re adults and should be able to handle a little criticism without you needing to hold their hand, right? Well, not exactly. They are adults, so they certainly don’t need you to treat them like children, but teamwork comes from all channels, including the manager-to-employee channel. So what does a brief, clear and authoritative review look like? Try this: "Your attitude with patrons is always stellar, and you have a great track record with our guests, but I've witnessed that your interactions in leadership roles with other staff are being received as condescending and arrogant. You have all the skills and talent needed for those roles, which is why I'm comfortable assigning them to you, so I'd like to work with you on tweaking the way you deliver your directives so that we're all on the same wavelength." Don’t surprise staff with reviews. They’re not something to be afraid of; they’re learning experiences, and they provide your staff with a very opportune moment to discuss issues that they may not have known how to broach before. Keep your language positive, as best you can. There’s never any excuse for talking down to your staff, even when the review has very little in the way of positive encouragement. Your staff are people just like you. When conducting reviews, start with your most senior staff, then the staff with whom you have the most interactions, and then pull in a mix of new and old staff members. This order shows your entire staff that you take the reviews of those immediately below you just as seriously as the newbies. Leaving other management staff to be reviewed last displays favoritism, and maybe even a lack of sincerity in their reviews. Mixing your senior staff’s reviews with the rest of the crew indicates that you view them all as equal, and that mentality will spread quickly, taking away authority from the entire management team. Remember to “sandwich” criticism around encouragement, stay focused on the overarching goal, and keep your talking points brief. If there’s one thing I learned well from my managers, it’s that working with your team as though you’re a separate entity will only get you so far. Take part in the work required to improve your team. Do your best to wear the most ideal hat for your team and management style, and with a solid handle on performance reviews at your disposal, you’ll create a star team sandwich even Joey Tribbiani could never resist.